Hey out there in blogland! 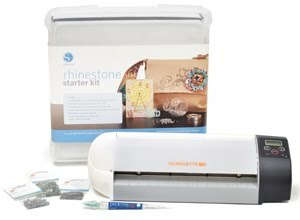 This month, the good people at Silhouette sent me their rhinestone starter kit to try out. I must admit, I wasn't so sure about how it would work out...but let me tell you...after making the shirt I'm about to show you for the Princess, I was hooked. No really. I've got some other fun ideas cooking in this little old brain of mine now. 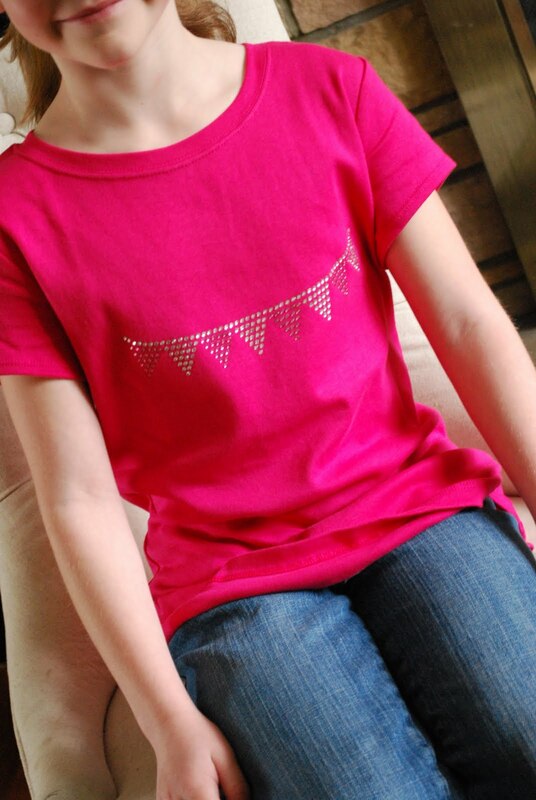 So without further ado, I present the Princess' blingy pennant tee shirt. How cute is that? And seriously, by simply following the directions included with the kit, I made the whole thing in just about 20 minutes. The Silhouette cuts a rhinestone template for you, then you just use the included brush and this amazing little tool called the Pick Me Up to position the rhinestones. After that you use the sticky rhinestone transfer paper - so well photographed below - to lift the rhinestones from the template and place them on whatever you want to transfer them to. It doesn't have to be fabric either...you can use them on paper if you want. Iron them on and VOILA! If you'd like to try the rhinestones yourself, here is the fabulous deal Silhouette is running this month. A perfect Mother's Gift, might I add. Click here to purchase, then click on the special bundle icon and use the code "SHABBY" to receive your discount. If you already have a Silhouette Machine and want to try the rhinestones, Silhouette is offering 30% off all things rhinestone! You don't need a special code to receive this discount. Frugal Friday goes live tonight at 10:00 pm EST as usual...See you there!! Neato! I would actually use this gizmo and shocking amount of the time. HA! i remember embellishing my jeans like this when i was a kid! thanks for your kind words today--no prob that i can't be featured...press from the last time is still rolling in. not to mention i've got much more to share! For years I have been looking for a Bedazzler for my daughter who loves bling! The rhinestone attachment looks wonderful... One more reason to buy a Silhouette! The shirt is adorable, Wendy!